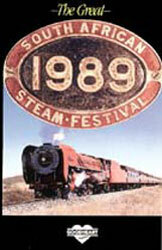 When released in 1990, this video was a dramatic testimony to the steam still thriving on South Africa's main lines across the northern Cape province and Karoo desert. Today, this video has attained the status of a classic documentary of a world-famous railroad scene that unfortunately is now gone forever. Take this opportunity to view an incredible 17 combinations of doubleheaders, from such wheel arrangements as 4-6-2, 4-8-2, 4-8-4 and even a 4-8-2+2-8-4, as South African Railways treated steam enthusiasts from around the world to nine days of non-stop operation of these preserved and regular service steam on scheduled passenger and freight trains.